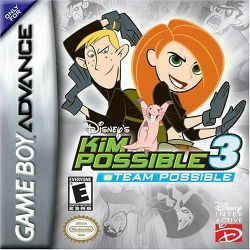 Disney's Kim Possible 3: Team Possible is the third video game of the Kim Possible series. Kim and Ron Stoppable have teamed up to form Team Possible, to defeat Doctor Drakken, Shego, and other supervillains. The game places the player in the role of Kim or Ron. This page was last edited on 13 August 2008, at 16:59. This page has been accessed 6,124 times.